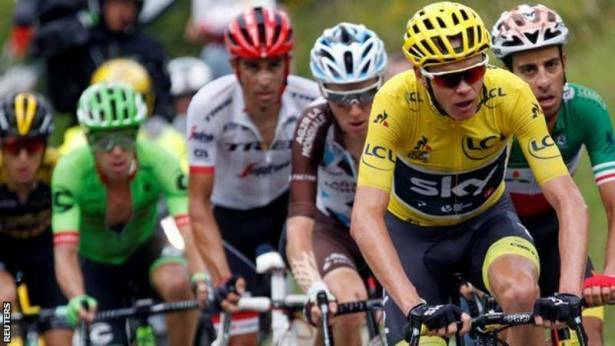 Britain's Chris Froome is one time trial away from a fourth Tour de France title and third in a row. The three-week 3,540km (2,200-mile) race started in Germany with a 14km individual time trial. It ventured through Belgium and Luxembourg before heading into France. The route took the 198 riders down the eastern side of France to the Jura mountains in the opening week before a rest-day transfer across to the Dordogne in the west. Two days in the Pyrenees mountains dominated the second week, while the third week was all about the Alps. And now we have a 22.5km individual time trial around the streets of Marseille on the penultimate stage that will prove decisive, with Froome in yellow but leading by only 23 seconds. "Certainly at this point it's my race to lose," said Froome on Friday. "I have to make sure I do everything right, follow the right processes and hopefully not have a bad day. I've got the legs, and hopefully everything else will be alright." As the yellow jersey wearer, Froome will start his time trial last, setting off down the ramp at 17:04 BST. His estimated finish time according to the Tour website is 17:32 BST. Team Sky team-mate Luke Rowe is in last place in the general classification - and is first out at 12:45 BST. Thomas produced a stunning time trial to win the opening stage. The Team Sky rider was not considered among the pre-stage favourites but covered the course in 16 minutes four seconds to claim his first Grand Tour stage and pull on the yellow jersey for the first time. Thomas' team-mate and defending champion Chris Froome finished sixth and gained an early advantage on his general classification rivals. Overall contender Alejandro Valverde (Movistar) was forced to abandon after crashing heavily into a barrier in wet conditions. Kittel powered home in a star-studded sprint finish to take the stage in Liege. Geraint Thomas held on to yellow by coming home safely in the peloton but there was a scare for Team Sky team-mate Chris Froome, who crashed in the wet 30km from the finish. He resumed and finished the stage in 37th. World champion Sagan showed remarkable composure to win stage three, triumphing in an uphill sprint after his foot had briefly come loose. Britain's Geraint Thomas continues to lead the race after finishing two seconds adrift, alongside defending champion Chris Froome and the other race favourites. Britain's Mark Cavendish accused world champion Peter Sagan of elbowing him as he crashed heavily in a sprint finish on stage four of the Tour de France. The two collided on the sprint finish into Vittel as they competed for the stage win. Arnaud Demare went on to win the stage, becoming the first Frenchman to win a bunch sprint at the Tour since 2006. Italian Fabio Aru made the decisive break a couple of kilometres from the summit La Planche des Belles Filles to move up to third overall. But Chris Froome put more time into his other rivals by finishing third to swap places with Team Sky team-mate Geraint Thomas at the top of the standings. On a blisteringly hot day, with temperatures on the road reaching 37C, Marcel Kittel sprinted to his second stage win of this year's Tour as the general classification contenders took it easy in the peloton. Kittel edged out Arnaud Demare to win an 11th Tour stage. Marcel Kittel equalled Erik Zabel's German record of most Tour stage wins with his third on this year's race and 12th in total. It took several minutes for the Quick-Step Floors rider to get the nod but he was judged to have beaten Edvald Boasson Hagen by just 6mm. It was a quiet day for the general classification riders with no changes in the standings. Lilian Calmejane delighted the home fans with a second French victory on this year's Tour after attacking on the final ascent and soloing to victory across the 12km plateau to the finish. His win followed a brutal opening two hours of racing with repeated attacks as riders tried to get in the break. Chris Froome said it was "an intense" day as he retained his race lead. The race resumed after the first rest day and once the lengthy breakaway by Elie Gesbert and Yoann Offredo was reeled in on the outskirts of Bergerac, the stage was always going to end in a sprint finish. German Marcel Kittel powered past his rivals to claim his fourth stage win of this year's race, his 13th in total. It took him one beyond Erik Zabel as the German with the most Tour de France wins. A three-man breakaway of Frederik Backaert, Maciej Bodnar and Marco Marcato attacked early on, with the peloton content to let them go before reeling them in later. However, just as the bunch were about to catch the leading group, Bodnar attacked and stayed out in front until the final 250 metres when he was finally swept up. At that point, German Marcel Kittel underlined his dominance in sprint finishes by easily claiming his fifth stage win of this year's race. On a thrilling first day in the Pyrenees, a group of 12 riders broke away before Britain's Steve Cummings left the rest behind with around 30km to go. Team Sky controlled the tempo on the front of the peloton, catching Cummings in the final 10km and looking to set up leader Chris Froome. However, a brutal summit finish in Peyragudes saw Froome crack inside the final 500m, with Romain Bardet winning the stage and Fabio Aru gaining enough time to take the yellow jersey. The shortest road stage of this year's Tour saw plenty of attacking early on before Alberto Contador and Mikel Landa broke clear with 60km remaining. The Spanish pair were joined by Nairo Quintana and Warren Barguil on the final climb before a rapid descent into Foix. Barguil proved strongest in the sprint finish, becoming the first Frenchman to win on Bastille Day since 2005. Behind, Chris Froome marked all the attacks by the other overall contenders but did not gain any time on Fabio Aru, who retained the leader's yellow jersey. A stage that in one sense ended as many predicted - with a sprint finish contested between eventual winner Michael Matthews and Belgium's Greg van Avermaet. But in another, it had a very unexpected conclusion, with Chris Froome taking the yellow jersey off Italian Fabio Aru after a dramatic charge up the short but punchy finish in Rodez. Froome, who lost yellow at the end of stage 12, turned a six-second deficit into an 18-second lead. A hilly stage saw a large breakaway group go up the road, from which Dutch rider Bauke Mollema attacked with over 30km to go, staying clear to claim his first Tour stage win. Behind, Romain Bardet and his AG2R La Mondiale team-mates put Chris Froome under pressure on the lower slopes of the Col de Peyra Taillade, distancing the race leader. Around this point the Team Sky rider also had a mechanical problem that forced him to swap his rear wheel with team-mate Michal Kwiatkowski, falling almost a minute behind his rivals. However, with the help of his team, Froome chased back and caught the group of favourites before the summit to ensure he retained the yellow jersey at the end of the stage. Michael Matthews and his Sunweb team-mates drove the pace on the first climb and quickly dropped struggling green jersey leader Marcel Kittel, who never caught back on. Australian Matthews took 20 points at the intermediate sprint and 30 points at the finish as he claimed his second win of the Tour and closed the gap to Kittel in the points classification to 29 points. Crosswinds in the final 20km fractured the leading group, with Ireland's Dan Martin caught behind and losing time, but Chris Froome safely held on to the yellow jersey. It was a fascinating stage that took us up to the highest point in the Tour this year - the Galibier at 2,642m. By that stage green jersey wearer Marcel Kittel had abandoned after crashing 20km into the 183km from La Mure to Serre-Chevalier. Slovenian Primoz Roglic won his maiden Tour de France stage after powering away towards the top of the Galibier and holding his nerve - and the advantage he had built - during a thrilling descent to the line. It was happy days for Chris Froome too, who finished third and added nine seconds to his lead. The first summit finish on the Col d'Izoard in Tour history arrived on the final day in the mountains. A breakaway group of 54 riders steadily splintered over the category one Col de Vars and on the run in to the Izoard, while the yellow jersey group remained together behind. Darwin Atapuma struck out alone in search of the stage win, only to be caught and passed by Warren Barguil as the Frenchman claimed his second and Team Sunweb's fourth stage of the Tour. Behind, Romain Bardet tried to attack Chris Froome but could not drop the Briton, having to settle for four bonus seconds by finishing third. With a lead of 23 seconds over Bardet and two flat stages and a time trial to come, this stage saw Froome take a big step towards a fourth title. A break of 20 riders went away 35km into the longest stage of this year's Tour, with the peloton content to let them build an unassailable advantage. A group of nine riders broke clear late on, before Nikias Arndt and Edvald Boasson Hagen left their rivals behind by taking the shorter right side of a roundabout in the final 3km. Boasson Hagen kicked again to win his third Tour stage and first since 2011. Chris Froome enjoyed a stress-free day in the yellow jersey to retain his 23-second lead over Romain Bardet. Rob's guide: Race organisers would have been hoping Chris Froome needed to make up time on some on his rivals, because I think him arriving in Marseille with any kind of advantage - even the slim one he holds - means it is race over. A bit of a hill two-thirds of the way into the test is not stiff enough to create any significant gaps. If nothing else, it should provide good images for the television. One to watch: Chris Froome. Don't back against him extending his advantage and chalking up another stage win. Rob's guide: And so to the now traditional early evening dash round Paris. The jerseys will have been decided and champagne will have been sipped on the road in from Montgeron - where the Tour de France started in 1903. Tommy Voeckler may well be allowed a lap out front on his own in recognition of his efforts before the serious racing begins for a coveted stage win on the Champs Elysees. One to watch: Andre Greipel. The German is chasing a third successive victory on the cobbles. He has won a stage on every Grand Tour he has ever raced in. Will he still be searching come Paris? Yellow - the coveted maillot jaune is worn by the rider who has taken the least cumulative time to complete the race after each stage and thus the overall Tour winner. The winner receives 500,000 euros (£440,000). Green - worn by the leader of the points classification. The maillot vert rewards consistently high finishes with points being awarded for intermediate sprint and end-of-stage placings. The winner receives 25,000 euros (£22,000). Polka dot - the maillot a pois is worn by the 'King of the Mountains'. Points are awarded on categorised climbs with the harder ascents offering more points. The winner receives 25,000 euros (£22,000). White - the maillot blanc has been awarded every year since 1975 and is open to riders aged 25 and under. If a rider is leading any other classification, that jersey takes precedence. The winner receives 20,000 euros (£17,600). Each stage winner receives 11,000 euros (£9,680). There is a 'most combative rider' prize, selected each day by a jury of four cycling experts. The rider is denoted by a red number on the following stage and the race's most combative rider - super-combatif - is decided after the final stage and awarded 20,000 euros. There is also a 50,000 euro (£44,000) prize for the best team performance, which is calculated by adding up the times of the first three riders on each team.